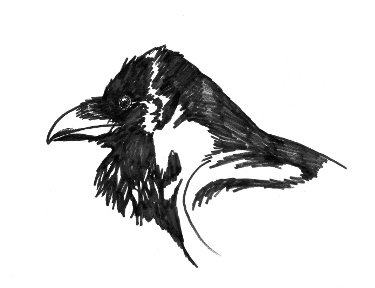 Learning how to draw birds is an excellent tool for getting to know them better. Long before photography existed, naturalists have been drawing wildlife. Even today when photography is so popular and common, the art of drawing remains an important and fun way to capture nature. Trying to capture birds can be difficult and drawing them can be approached in many ways. Below, it will be broken down into several techniques that have been proven effective in drawing a wide variety of subjects. I suggest working with a pencil, at least initially so that your work can be erased easily and so you can make your beginning sketches light. They are present in ink here for better clarity. Good observation is the key to drawing anything. Before you attempt to draw any bird, sit down near a bird feeder or by a pond or other location that birds frequent and simply observe them. If that is not available to you, find a book, magazine or look online for photos of birds. Look closely at how the birds appears. Notice their bill, eyes, head, wing, feet, tail and other parts. See how those parts come together, and also - if you are watching a live bird - see how it moves its body as it explores or feeds. Notice how your subject's feathers can lay flat against the body or be fluffed out. It is very helpful to have at least a basic understanding of how a bird is put together. For this, you need to learn some bird anatomy. Different birds have different shapes and lengths of bills, wings, tails, feet and legs and other parts. 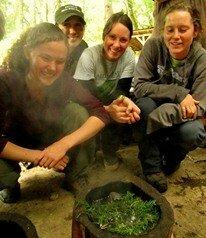 All of these are shaped so as to best serve that particular birds needs. Visit this link on bird anatomy to you help you learn how to draw birds. A bird is actually an extremely complex collection of parts and features, and this can leave the person trying to draw one in a state of frustration. It can help to see the bird as a collection of simple shapes such as circles, ovals, eggs and triangles when learning how to draw birds. 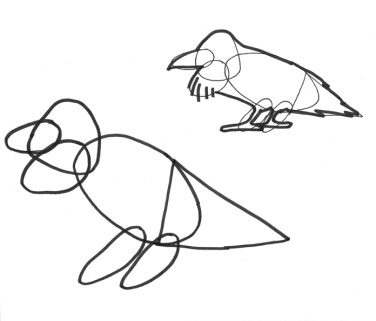 Find an image of a bird, and try drawing it out in terms of its simplest shapes. Then, go from there an add some lines on top of that. 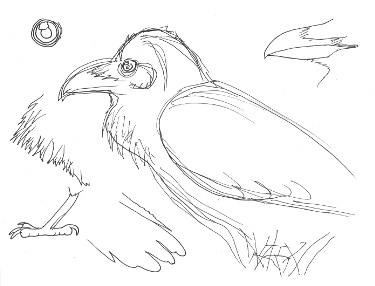 A good next step in learning how to draw birds might be to do a basic sketch of the bird you are viewing. One method to do this is to do high speed line drawing of what you see. This technique involves fast, repeating lines that loosely capture the subject. This is of great assistance when you are drawing a live bird, as they don't generally sit still for long. A variation on this technique is to keep your pencil on the paper from start to finish. In learning how to draw birds, it also helps to break your subject down into parts, and do simple drawings of each part separately. Keep it simple and leave the detail work for later. If you are drawing a wild bird, do include at least some of the plumage patterns you see on the bird. These might be useful later on. At this point we are moving into the realm of finer, more detailed work. You may choose to stop at the point of making a sketch. But if you choose to go on, look carefully at the areas on your subject that are darker and those that are lighter. You can try a simple exercise that can help you see those areas better. Take your drawing implement of choice and draw only the shadowed areas on the bird you are looking at. It can help to have a basic outline drawing to fill in, so that your shadows end up in relatively the appropriate places on the body. You can also try putting shadows over the sketch you have created earlier. 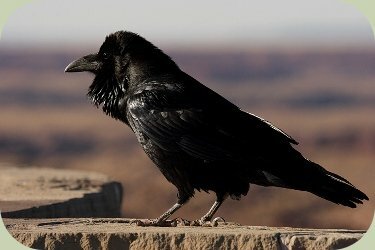 The bird that was drawn here happens to be an all black raven, but most birds have various colors spread in various blotches, spots, stripes and other markings on many parts of the bodies. If you are drawing in the field, making quick sketches to capture the field marks can be very helpful. Despite the popularity and relative simplicity of modern photography, drawing remains an indispensable means of recording what we observe in nature. Learning how to draw birds is also a wonderful teaching tool which encourages us to focus our attention on details in a manner that helps us retain the information more effectively, and also helps us develop a stronger search image for the species we focus on. Grab a pencil and some paper, and try drawing a bird today!